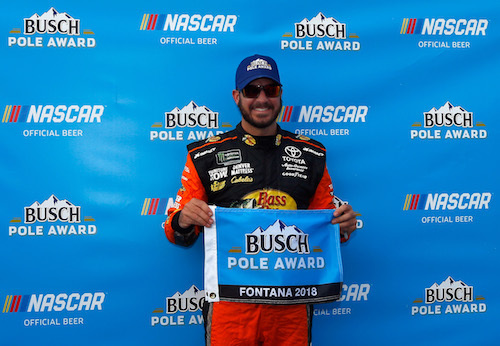 Martin Truex Jr. claimed his second-consecutive Monster Energy NASCAR Cup Series pole Friday with a 38.592-second/186.567 mph lap in the third of three rounds of qualifying at Auto Club Speedway in Fontana, Calif., to claim the top starting spot for Sunday’s Auto Club 400. It’s his first-career pole at ACS the 17th pole of his career, overall. Toyota swept the front row on the starting grid Friday with Kyle Busch qualifying second. Kyle Larson qualified third, and Erik Jones was fourth to give Toyota three of the four starting spots in the first two rows. Austin Dillon rounded out the top-five in qualifying. Kevin Harvick qualified 10th after dominating the top of the speed charts until the final round of qualifying. He was the fastest in the day’s only practice session and in the first two rounds of qualifying. His 38.147-second/188.744 mph lap in the opening round was the fastest, overall, in qualifying and set a new track qualifying record. Stewart-Haas Racing teammates Harvick, Clint Bowyer and Aric Almirola posted the three fastest laps in practice earlier in the day, but when qualifying rolled around, Bowyer and Almirola’s teams were among the 13 teams that had issues getting through pre-qualifying inspection that resulted in not making qualifying runs. As a result, only 24, the exact number that advance from round one to two, made official qualifying attempts in the opening round. With all who made a qualifying lap in round one advancing to round two, several teams/drivers used to qualifying in the back cracked the top-24. Four of those teams/drivers opted to sit-out round two, deciding instead to save their tires for race day and accepting starting spots 21st through 24th. But, because of the large number of cars not getting onto the track in qualifying and getting to start the race on new tires, NASCAR will give teams the option of buying an extra set of tires on which to start the race, provided they turn-in their qualifying tires to Goodyear, not making any Saturday practice laps on them.